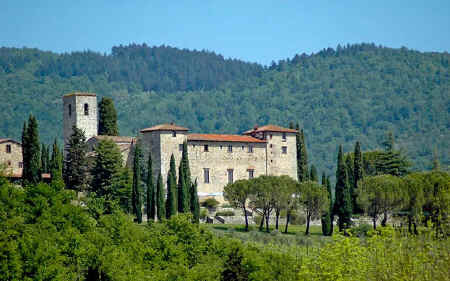 Stay at the Castello di Spaltenna. 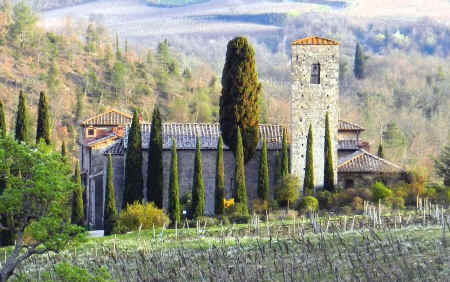 Spaltenna is a classic example of a Tuscan fortified settlement consisting of a monastery (previously a castle), a parish church and a cluster of farmhouses. Spaltenna is first recorded in a number of documents dated 1030 and originating from the Badia a Coltibuono. The foundation is undoubtedly much older and the bell tower is thought to date from about the year 1000. Sometime between 1102 and 1110, the pieve (parish church) di San Pietro in Avenano was transferred to Spaltenna where it was given the name Santa Maria a Spaltenna and was transformed into a "pieve munita" - an "armed parish church", meaning fortified. The church of San Pietro in Avenano kept this name until at least 1153 when, in a bull by Anastasius IV sent to the bishop of Fiesole, it was mentioned by the pope as the parish church of "Santa Maria a Spaltenna". The monastic structures that grew up around the church eventually replaced the much earlier castle. The whole complex became a benefice of considerable value and was sought after by the richest families of the area. 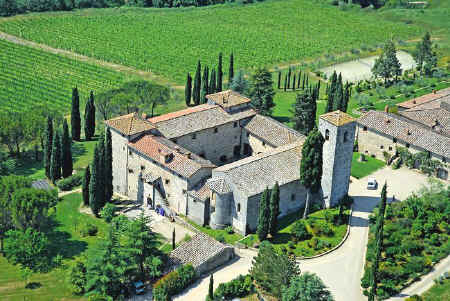 Eventually, Spaltenna became the property of the Ricasoli family, owners of the land and also the farm of the Pieve di San Polo in Rosso. Spaltenna lost its status as a parish church in 1708. Today the complex as a whole is once more referred to as a castello and is a tourist resort. 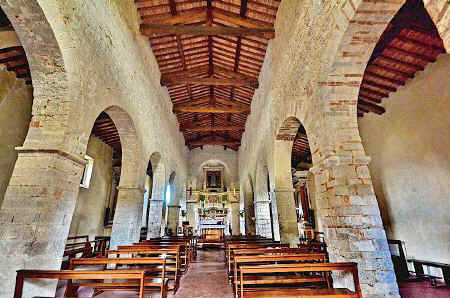 Like a great many of the ancient parish churches of Chianti, the Pieve of Spaltenna is Romanesque with stone walls and a roof supported by wooden trusses, three aisles and a single circular apse. The square, stone pillars separating the aisles are also characteristic of the period. Back to Gaiole in Chianti.